Electrocardiogram (ECG) or photoplethysmograph (PPG) wearable monitoring systems have become increasingly popular in recent years. Heart-rate monitors, pulse oximeters and activity trackers are commercially available and already play an important role in everyday life. A wearable monitor significantly improves patient comfort by replacing long, cumbersome cords with much less obtrusive dry electrodes that enhance mobility. The wearable monitor market is experiencing rapid growth, fueled by an increase in health awareness and the advent of improved monitoring services. Of specific importance is the Internet of Things (IoT) concept of tracking vital signs via mobile apps, with data transmission through the cloud to a doctor or health service. This concept, combined with machine learning and artificial intelligence, is expected to take fitness tracking and health monitoring to the next level by contributing to predictive analytics (and thus preventive care) to improve health and reduce health care costs. A PPG takes optical measurements of an organ’s volume to estimate the oxygen saturation level in the blood (SpO2). There are two types of optical arrangements: transmissive and reflective. The transmissive case uses a bulky finger clip to transmit light through a light-emitting diode (LED) on one side of the finger and measures the absorption by placing a sensitive photodiode on the other side. The finger clip applies some pressure, which causes discomfort over time. In the reflective arrangement, the photodiode and LED are on the same side and the photodiode collects the light reflected from various depths underneath the skin without using the finger clip. This type of mechanism is easily incorporated into watches and other wearable devices that touch the body and do not cause any discomfort. Conventional ECG monitoring uses a coupling gel on the sensing electrodes, which must be placed correctly on the patient’s body by a professional. Some patients develop allergic reactions and skin irritation when these electrodes are used for long-term ambulatory monitoring. Moreover, the gel also dries out over time, reducing signal quality and performance. In recent years, there has been a growing interest in using dry or ungelled electrodes for long-term physiological monitoring. TI’s extensive portfolio supports emerging market trends. For example, the Wearable, Wireless, Multi-Parameter Patient Monitor Reference Design uses the AFE4900 single-chip bio-sensing front end for synchronized ECG and PPG measurements (see Figure 1). It integrates flexible LED drivers with complete receiver chains for the photo diodes. It communicates with the CC2640R2F SimpleLink Bluetooth® low energy Wireless MCU, which has an integrated Arm® Cortex-M3 and 2.4GHz radio-frequency (RF) transceiver, over Serial Peripheral Interface (SPI) (or I2C). The design supports wired data capture using a Joint Test Action Group (JTAG) connection, as well as wireless data capture, by sending it over Bluetooth® 5. Synchronized PPG and ECG measurement using the AFE4900. If the ECG and PPG are measured in a synchronized manner, the time difference between the R-peak (usually the highest peak observed) in the ECG waveform and the arrival of the PPG wave in the extremities is a measurement known as pulse transit time (PTT). 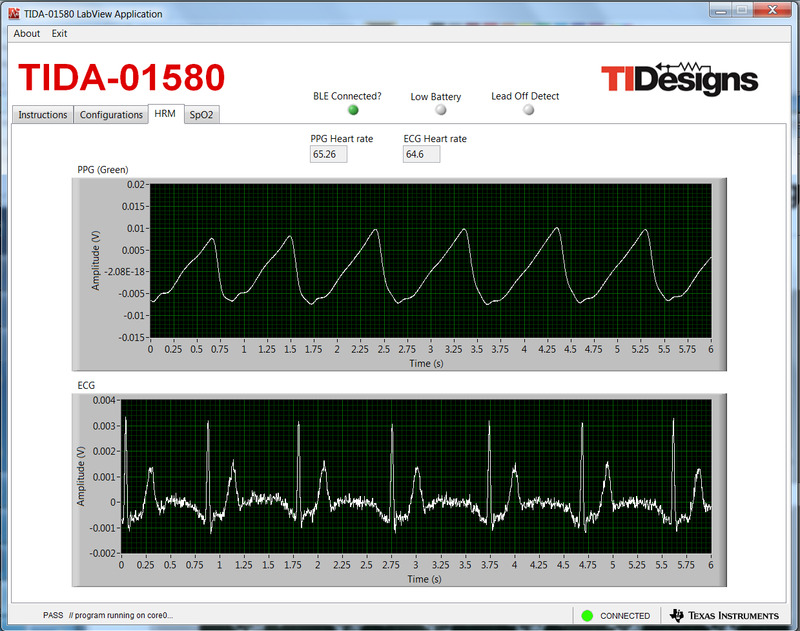 The reference design provides synchronized raw data for designers to calculate heart rate, SpO2 and PTT. 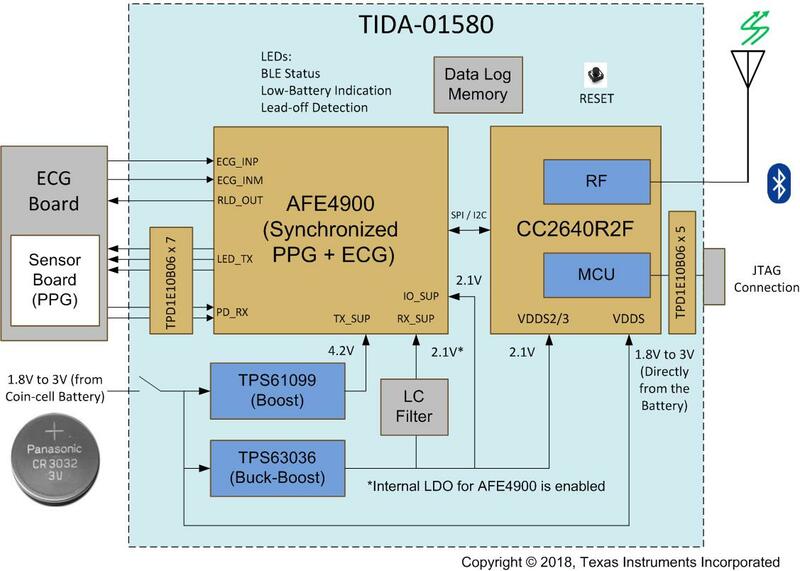 The AFE4900 is distinctive in the market with its level of integration, low power and size, and offers flexibility with ultra-low-power modes and integrated first-in first-out (FIFO), which can keep the MCU in sleep mode to increase battery life. Wireless connectivity using the CC2640R2F. The CC264R2F integrated Arm Cortex-M3 plus 2.4GHz RF transceiver supports Bluetooth® 4.2 and 5.0 profiles and is also used as host processor. The internal DC/DC converter helps improve overall system efficiency and extend battery life. The built-in low-battery detection algorithm helps reduce external components in portable wearable applications. Low-power operation with a coin-cell battery. The design uses a single CR3032 (3V, 500mA coin-cell battery) and is tested to give 100 hours of continuous operation and a battery life of 30 days for every 1 second per minute of transmission. A LabVIEW-based graphical user interface (GUI) is implemented for testing the reference design. Figure 2 shows measured ECG and PPG data on a remote terminal. The reference design was created for medical, personal health care and fitness applications, and comes with a design guide, schematic, layout and bill-of-materials files to help you quickly evaluate and accelerate product development. It facilitates real-time monitoring and data-logging capabilities and supports optimization for different configurations. Are you designing a wireless patient monitor? What are your biggest challenges? Tell us in the comments. Watch the wireless multiparameter patient monitor demo. a very impressive design, well done. Can TI indicate one enterprise that build this hardware for me, due to the soldering process is very complicated. So what company can fabricte the PCB and assemble the components. Can Texas Instruments help me, please? Hello Jose, thank you for your interest in TIDA-01580. The boards are built in India as it was designed here in India. Is it okay for you to have Indian manufacturer contact? Good Job! When can buy the TIDA-01580? We do want to test it. We will build our product on the good design. Hello Xin Wang, Thank you for your interest in TIDA-01580. Unfortunately, this is just a reference design and not for sale. However, the gerber files, Altium schematic and layout files are available on www.ti.com/.../tida-01580. You can build your own board based on the gerbers. If you are doing your own board and design, we can review your schematic/layout. Please post your project files and queries on e2e.ti.com with TIDA-01580 included in subject line. Thank you. Hey Sanjay. Very innovative design. Can you please tell me what kind of software did you use to draw the schematics. I am participating in the IICDC 2018 competition and require to submit the schematics of my project. I am finding it very difficult to draw such complicated circuits due to the time limitation. Hello Prashant, Sorry for the delay in reply. Sanjay, a excellent proof of concept! Congratulations on a job well done.